Shaving brushes make it easier to shave and a good shaving brush is essential in obtaining the perfect shave. Boar and badger bristles are preferred because their hair absorbs water instead of repelling it, allowing water in the brush to mix with the shaving soap. The bristles aerate the water and soap to form the lather. The lather is used to lubricate and protect the skin during shaving. The bristles also mildly exfoliate the skin. Boar bristles are thicker, stiffer and hold less water. They are also less expensive than badger bristles. Some believe that boar bristles are better suited for harder soaps. Badger bristles are obtained from badgers that have been killed in China, where they are regularly eaten. Pure badger shaving brush - Typically, pure badger is the lowest quality because the bristles come from the badgers back. These brushes are typically the hardest of the badger brushes and the bristles have a dark color. Deluxe badger shaving brush - Deluxe badger is the middle of the road badger brush. Bristles on deluxe badger brushes exhibit white tips and a dark band toward the brush handle. Silvertip badger shaving brush - Silvertip is the highest grade, using very soft white bristles that have a smaller dark band near the handle. Silvertip bristles come from a badger’s neck area. Shaving brushes come in all sorts of sizes and at different prices. When looking to buy a brush, the handle should be comfortable in the hand, and the bristles should be tightly packed. The diameter of the bristles at the handle end is called “knot size,” and is used to measure how large the brush is. Larger knot-sized brushes more easily create larger amounts of lather but are sometimes hard to use on smaller faces. Once again, the size of the brush you choose comes down to personal preference. 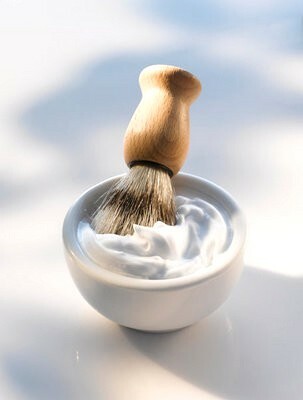 During the shave, if the lather becomes dry, use your shaving brush to add more moist lather. This is of utmost importance because when the lather becomes dry the razor stops cutting. After shaving, rinse your shaving brush with warm water until all the lather has been removed. Flick out the excess water and then store it until the next time you shave. There has been much debate over whether it’s best to store a shave brush with the bristles up or down, with many good points on each side. Therefore store it whichever way you want.